High-resolution anatomical and functional images can be acquired using high- andultrahigh-field magnetic resonance imaging (MRI) systems. An increase in the mainmagnetic field strength results in high resolution but suffers from thedisadvantage of field nonuniformity in the radio frequency (RF). To overcome thisRF field inhomogeneity, parallel RF transmission system and sensitivity encodingare widely used. Our experimental results showed that the best signal intensity was in transmit andreceive mode head coil, except for the T2-weighted fast field echo (FFE). The bestsignal-to-noise ratio (SNR) was in the 32-channel head coil. In general, multiple-channel coils have been known as more efficient materials interms of SNR. However, they may not be as important in experiments where intensityis an important factor. Therefore, a suitable coil should be selected using apulse sequence. In clinical and research fields, 3.0-T magnetic resonance imaging (MRI) systems havebeen widely used. Increasing the main magnetic field strength (≧3.0 T)offers the advantage of high resolution but results in the disadvantage ofnonuniformity in the radio frequency (RF) field because of the short RF wave length(Hoult and Phil ). To exploit the inherent advantages and to overcome the challenges ofusing high-field scanners for the MRI, dedicated RF coils such as multi-channel RF(Adriany et al. ), sensitivity encoding (Pruessmann et al. ), transverse electromagnetic (Vaughan et al. ), and micro-strip transmission line volume coils (Zhang et al. ) have been developed. In the present study, four RF head coils [transmit and receive mode (T/R) head coiland 8-, 16-, and 32-channel head coils] were evaluated and compared in a 3.0-T MRIsystem. The commercial RF head coils were provided by Philips Medical System(Cleveland, OH, USA). Except for the T/R head coil, the multi-channel RF coilsoperated in the Rx mode only. For high-quality image acquisition, an MRI user had toadaptively select the RF coil according to a given RF pulse sequence. Each RF coilperformance was evaluated and compared in terms of signal-to-noise ratio (SNR), sliceprofile, and RF field uniformity. As a result, a parallel RF transmission system and an increased number of RF coilchannels can improve the SNR. However, the T/R head coil has the highest signalintensity with a high noise level. An MRI user must adaptively select the RF coil forthe image using the RF coil evaluation results in this study. The purpose of this study is to evaluate the T/R head coil and the 8-, 16-, and32-channel head coils using each RF pulse sequence [T1-weighted spin echo (SE),T1-weighted fast field echo (FFE), T2-weighted turbo SE (TSE), and T2-weighted FFE]in terms of SNR, slice profile of the images, and RF field uniformity. The imagepositions were at the center and edge (slice offset, 40 mm) slices of the waterphantom. These evaluation and comparison studies were conducted on a Philips Achieva3.0-T MRI system (at the Korea Basic Science Institute, Ochang, Republic of Korea)using a uniform phantom provided by Philips Medical System. Two types of magnetic resonance (MR) pulse sequences were tested: the SE RF pulsesequence and the FE RF pulse sequence which is the same as the gradient echo. Figure 1 shows the basic MR pulse sequences of the SEand FE. 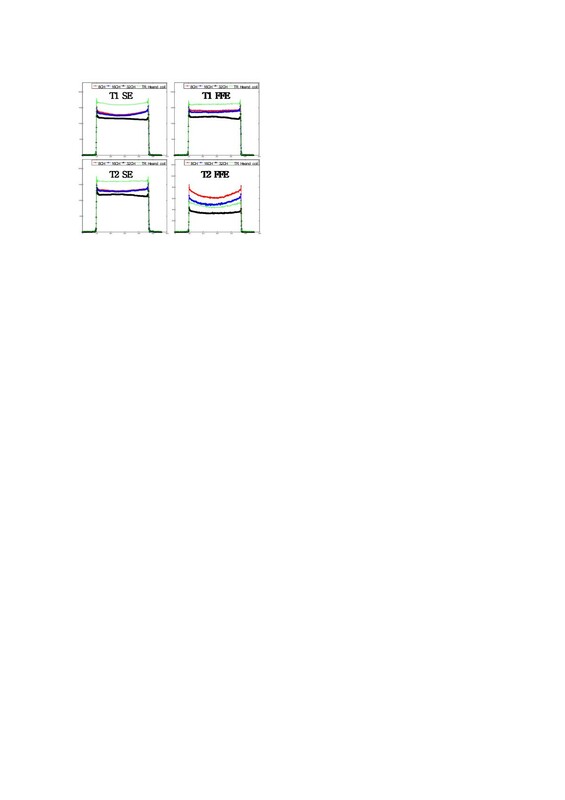 SE and FE pulse sequence diagrams. Left, SE; right, FE. The images were acquired by the Philips Achieva 3.0-T MRI system. The T/R headcoil was operated in the Tx/Rx mode in the quadrature transmission mode, and theother multi-channel coils used the Rx mode only. Two images (center and edgeslices with a 40-mm gap in the water phantom) were acquired per type of pulsesequence. The parameters for the T1-weighted images with the SE pulse sequence are echo time(TE)/repetition time (TR) = 10/500 ms, field of view(FOV) = 240 × 240 mm2, reconmatrix size = 560 × 560, slicethickness = 5 mm, and flip angle = 90°. The parameters for the T2-weighted images with the SE pulse sequence areTE/TR = 80/3,000 ms,FOV = 240 × 240 mm2, recon matrixsize = 560 × 560, slicethickness = 5 mm, flip angle = 90°, refocusingangle = 120° (refocusing control), and TSEfactor = 15. The parameters for the T1-weighted images with the FFE pulse sequence areTE/TR = 4.60414696 (in-phase)/250 ms,FOV = 240 × 240 mm2, recon matrixsize = 560 × 560, slicethickness = 5 mm, and flip angle = 80°. The parameters for the T2-weighted images with the FFE pulse sequence areTE/TR = 16.1145134 (in-phase)/685 ms,FOV = 240 × 240 mm2, recon matrixsize = 560 × 560, slicethickness = 5 mm, and flip angle = 18°. The MR images were acquired using a water phantom (16-cm-diameter refill bottleprovided by Philips Medical System). 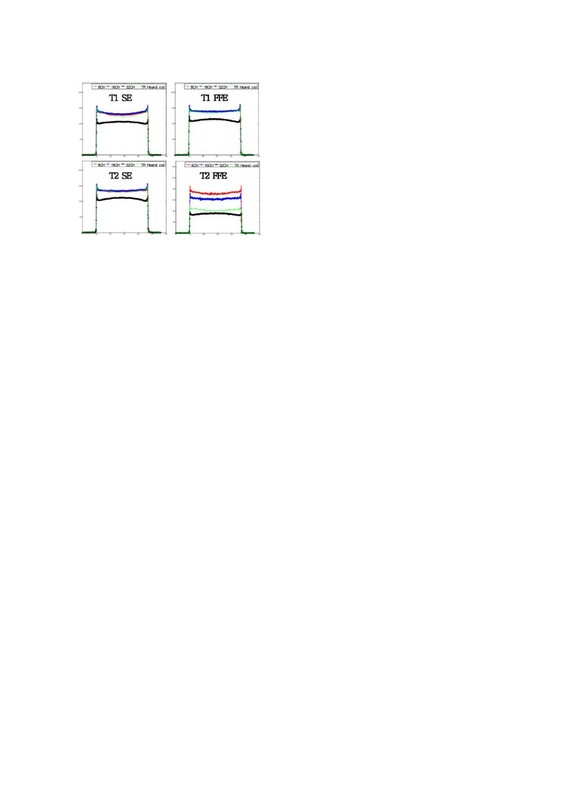 Four RF coils were evaluated using the fourtypes of sequences (SE and FE with T1 and T2 weighting). All experiments were performed under the same condition. 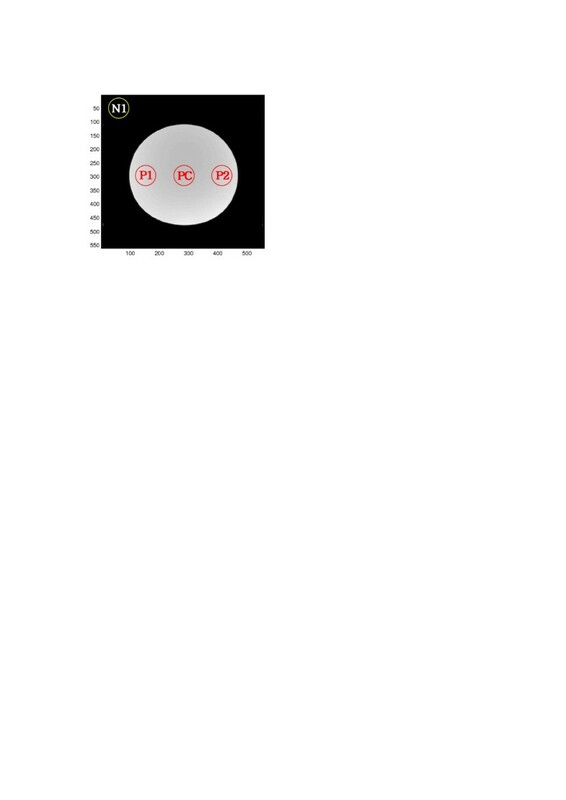 The signal-scale rangeswere set to be the same prior to the image acquisition. After the imageacquisition, the contrast and signal-scale ranges were set to be the same usingMATLAB (Mathworks, Natick, MA, USA). The digital imaging and communications in medicine (DICOM) images of the edge andcenter slices are shown in Figures 2 and 3, respectively. They were set at the same signal scale and contrastranges. From the results, the T/R head coil shows maximum image signal intensitylevel in all sequence parameters except for the T2-weighted FFE. MR images obtained by different types of pulse sequences and RF coils.The DICOM images have the same intensity scale (edge slice in waterphantom-foot direction). MR images obtained by different types of pulse sequences and RF coils.The DICOM images have the same intensity scale (center slice in waterphantom). Increasing the RF coil elements resulted in the decrease in the signal intensity. Onthe other hand, the 32-channel head coil has the highest SNR and the lowest noiselevel, as shown in Figures 4 and 5. Slice signal intensity profile of the center slice images. Slice signal intensity profile of the edge slice images. Additionally, we confirmed that the T/R head coil has the highest signal intensity,and the multi-channel RF coils have a high SNR. Figure 6shows the positions of each image where the signal intensity, noise (three-pointcenter slice), and SNR were calculated. 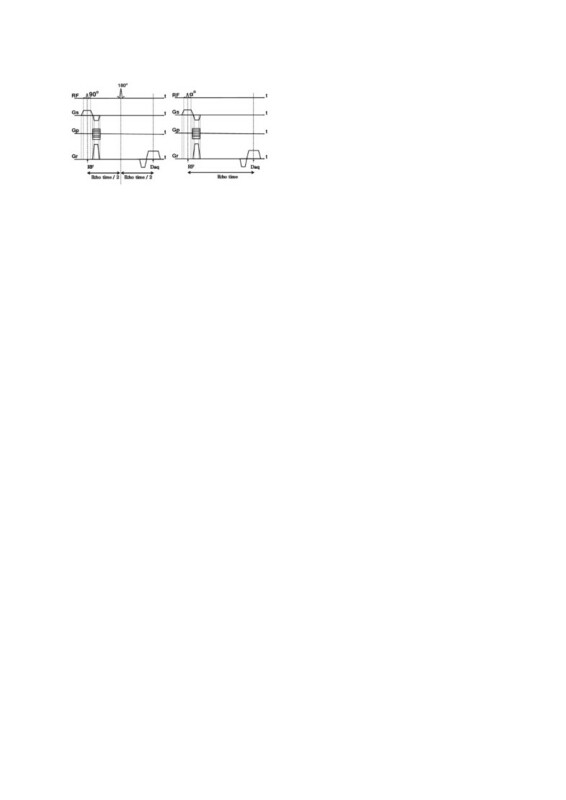 Calculated positions of the signal intensity and noise. With the exception of the T2-weighted FFE, the T/R head coil has the advantage interms of signal intensity. On the other hand, the 32-channel head coil shows the bestperformance in terms of SNR. In the T2-weighted FFE imaging, we can use an 8-channel head coil for the signalintensity and a 32-channel head coil for SNR. For the other weighted images, a T/R head coil can be selected for the signalintensity, and a 32-channel head coil can be selected for SNR. In general, multiple-channel coils have been known to be more efficient materials interms of SNR. However, they may not be as important experiments where the signal intensity is animportant factor. Therefore, a suitable coil should be selected using the pulsesequence. In other words, the coil that must be used in experiments that require high intensity(such as fMRI) and a signal from a phantom or a coil in terms of its purpose (such asSNR and CNR) in the anatomical image should be selected carefully. JP designed experiments and wrote the manuscript. JC analyzed the data and CL supervisedthe study. All authors read and approved the final manuscript. This article is published under license to BioMed Central Ltd. This is an Open Access article distributed under the terms of the Creative CommonsAttribution License (http://creativecommons.org/licenses/by/2.0), whichpermits unrestricted use, distribution, and reproduction in any medium, provided theoriginal work is properly credited.